Chef Scott Bagshaw's Máquè feels like an extension of his second Winnipeg restaurant Enoteca, which is a very good thing when you consider that Enoteca is one of the ten best new restaurants in Canada. Like Enoteca, Máquè it is a tidy and comfortable space with an open kitchen and seating for around 30 people (five or so four-tops, a couple tables for two, a counter for three looking out the front window and two seats at the open kitchen counter). There's a nice little wine list with food-appropriate reds and whites, some cava, three beers from Anchor Steam and one whisky. Anyway, Bagshaw now has three really, really great restaurants in Winnipeg (the original being South Osborne's Deseo -- whose crunch salad and mac & cheese remain my favourite versions in the city) that I'm telling you would be hits anywhere. Now that we've gotten all that out of the way let's talk food, because at Máquè all the dishes we tried were deeply delicious and artfully plated, and all at a pretty reasonable price tag of $12 to $18. The dishes, as the name should indicate, feature an abundance of Chinese flavours (along with influences from all over Asia) with the sauces having strong savoury and umami elements with smatterings of spice. For starters, the dish I am still craving badly three days later featured duck confit and Chinese sausage tossed with egg noodles in a magical sauce of chili and fermented beans all topped off with mustard greens and "crispy things" (pictured at top, $19). 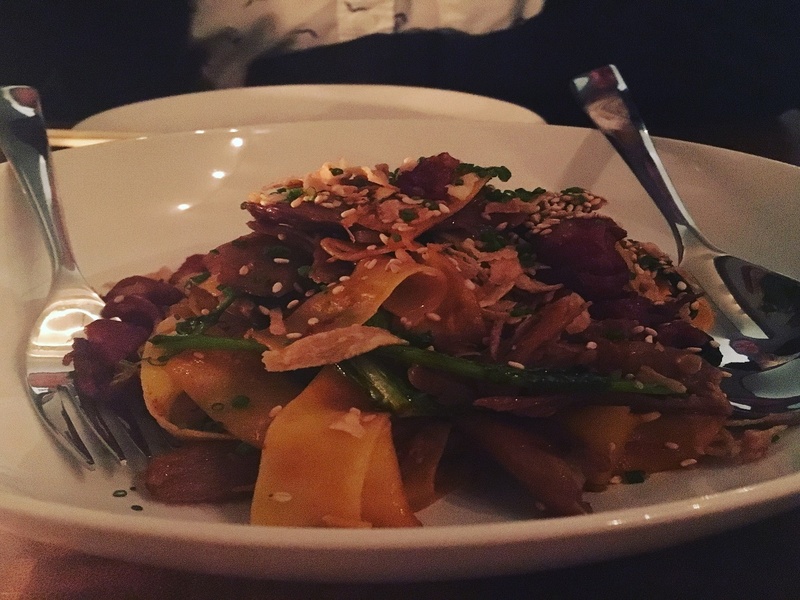 The flat noodles were perfectly toothy, each individual strand of duck was rich, sweet and juicy, while throughout the dish there was no shortage of varying textures. And that sauce, oh man, it had everything going for it; its aroma when it hit the table was enough to make you call dibs while the combination of slight heat and pungent flavours from the bean paste made you wish it would never end. I could equally see eating this dish solo while sitting at the Máquè countertop sipping a Charles and Charles dry rose (which is on the wine list) or having it at a Singapore hawker stand after a few too many Tigers. Enoteca's beef tartare made my list of favourite dishes from last year and the Máquè version ($17) -- with its umami elements from tamari sauce and briny capers, along with an added texture from sunchoke chips -- is equally as good. The second dish we had of Brussels sprouts ($16) was pretty cheeky featuring truffled sausage that had been transformed to a crumble that had the exact look and texture of simulated bacon bits (remember those from your caesar salad?) but a flavour that was anything but. The sprouts were cooked perfectly, with a nice char and a centre that was cooked through yet still firm, while there was an aioli with the beefy, porty flavour of a Perigueux sauce and a lime slice to add your own brightness. The meal opened with an ode to David Chang's Momofuku restaurants with baos (two for $6) featuring sliced Nagano pork belly (that had a really tasty bark on the top layer) along with some slices of barely pickled cucumbers and a sśam sauce. They were great, as was the play on beef and broccoli that featured a large cut of braised beef brisket ($19) that also had a crispy bark and a rich, spoon-tender centre. It was topped with some al dente broccolini and a smoked oyster sauce that was super savoury. Finally, there was a good slab of succulent pork belly that was seemingly encrusted in a soy gastrique and topped off with a Brussels sprout kimchi. It reminded me of the best way to cook bacon (which of course is to baste in a combination of maple syrup and Korean hot sauce then bake in an oven at 400 degrees until crisp) but with way more meatiness, along with the complex addition of the bitter and lightly fermented flavours from the sprouts. The hazelnuts too were a welcome addition, while the sweetness of the gastrique was kept in check by the saltiness of the other elements. The clincher is the fact that these high calibre dishes all came out during a soft opening, a time when many other restaurants flounder while trying to find their footing. The service staff too is great, composed of pros from several of the city's best restaurants who regular Winnipeg diners will recognize. Make your reservations today as foodies will surely soon flock to this bird. Máquè is located at 909 Dorchester Avenue, and is now open Tuesday-Sun, from 5 p.m. to 12 a.m. For reservations please call 204.284.3385.